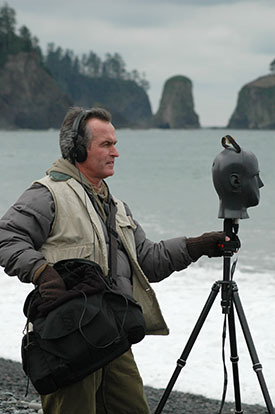 Gordon Hempton is an acoustic ecologist, a sound recordist who has spent his working life recording sound and developed a sense of the intrusion of human generated ‘noise’ into the natural soundscape. The One Square Inch project is a consequence of his search for quiet places. He aims to maintain one point of quiet, without noise intrusions in Olympic National Park. In 1984 he identified in Washington State 21 “quiet places” which did not include human noise intrusion, but by the early 1990s only 3 of these remained. He estimates in the lower 48 of the USA there are only 10-12 quiet places left. Hempton challenges us to close our eyes and listen to the world you live in. After only a few seconds you will hear this “lack of true quiet, of silence”. It is our birthright to listen, quietly and undisturbed, to the natural environment and take whatever meanings we may from it. By listening to natural silence, we feel connected to the land, to our evolutionary past, and to ourselves. The day will come when man will have to fight noise as inexorably as cholera and the plague.” So said the Nobel Prize-winning bacteriologist Robert Koch in 1905. A century later, that day has drawn much nearer. Today silence has become an endangered species. Our cities, our suburbs, our farm communities, even our most expansive and remote national parks are not free from human noise intrusions. Silence is not the absence of something but the presence of everything. It lives here, profoundly, at One Square Inch in the Hoh Rain Forest. It is the presence of time, undisturbed. It can be felt within the chest. Silence nurtures our nature, our human nature, and lets us know who we are. Left with a more receptive mind and a more attuned ear, we become better listeners not only to nature but to each other. Silence can be carried like embers from a fire. Silence can be found, and silence can find you. Silence can be lost and also recovered. But silence cannot be imagined, although most people think so. To experience the soul-swelling wonder of silence, you must hear it.